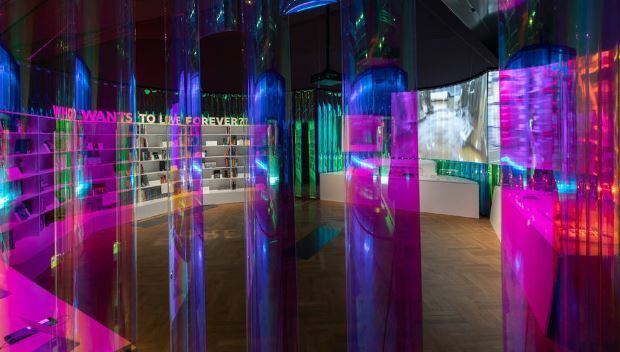 A new exhibition at the Victoria and Albert Museum in London brings together new and developing technologies that could shape the future. The Future Starts Here is on show at the Sainsbury Gallery until 4 November. The exhibition takes the form of four dramatic installations, each taking a future-oriented look at an aspect of contemporary life: Self (what makes us human? ), Public (are cities still for everyone? ), Planet (should the planet be a design project?) and Afterlife (who wants to live forever?). Each installation, designed by the Office for Political Innovation and curated by Rory Hyde and Mariana Pestana, asks broad questions about the future of city, identity, environment and archiving, allowing an eclectic mix of designs, prototypes, products and projects to answer. One of the exhibition’s recurring themes is data and how it is woven into life - many of the exhibits show something of the physicality of data, which is both intimate and global. Data collection is integral to many of the designs that seek to extend and improve life and diversity. Data is not neutral however, a fact underlined by the presence of Aquila, an aircraft being developed by Facebook to be sent high into the atmosphere to provide internet connection to disconnected regions. The solar powered craft is planned to be part of a fleet which can fly for 3 months at a time. Tiny when seen in the sky from the ground, the craft has a 40 metre wingspan, making it the largest object ever installed at the V&A. It is designed to send the internet to – and by extension collect data from – people in areas which are remote or lacking in internet infrastructure. Aquila is on display alongside Big Glass Microphone, which analyses micro-vibrations in fibre optic cables under the streets of Stanford, California to produce a real-time map of citizen activity, a work they've commissioned from San Francisco-based data visualisation firm Stamen. It analyses the micro-vibrations within the "incidental infrastructure" of an existing fibre optic cable under the streets of Stanford. Using this information, a real-time map of the movements of people and vehicles within the city was created. "What Stamen are pointing out is that the next frontier over who owns this data will be played out in cities, and it will be played out in the physical world as much as in the digital one.” – Rory Hyde, curator. Another physical aspect of data is its interaction with living organisms. Heather Dewey-Hagborg’s portraits of Chelsea Manning, generated from an algorithm which analyses the whistleblower’s DNA, takes yet another approach to the question of how data links to privacy, identity, entrapment and empowerment. Meanwhile Drew Berry’s biomedical animations show how microbiology is working with data and technology to give increasingly defined insight into how organisms work. Another theme the exhibition is longevity – of the planet, of humans and of waste. An artificial photosynthetic leaf made of silk protein can absorb carbon dioxide and produce oxygen. A prototype sailboat seeks to skim oil spills from ocean surfaces. An underground nuclear storage facility in Finland is being built to bury waste safely for 100,000 years. A zero gravity 3D printer being developed by NASA is potentially capable of building factories in space. Each of these addresses the anthropocene and its impact on earth resources from a different angle. The Future Starts Here displays a mind-boggling array of ideas for future responses to today’s problems and questions. It’s impossible to know which of these ideas will expand into mass production and mainstream culture the future, but it seems likely that some of them will ‘shape the future’ emphatically in the coming decades, and it’s certain that they are all shaping the ‘future question’ narrative today.